The table of Bedouin bags snapped me back in to a state of sartorial alertness. For the past couple of days I have been walking around press days in a cloud of sickness induced apathy. Of course I have seen a great number of collections that would normally leave me open mouthed and clammy palmed but I found it difficult to become as excited as I really should do because when I've not been in bed I've longed to rest my weary head. I was soon snapped out of it though after I encountered Bedouin. 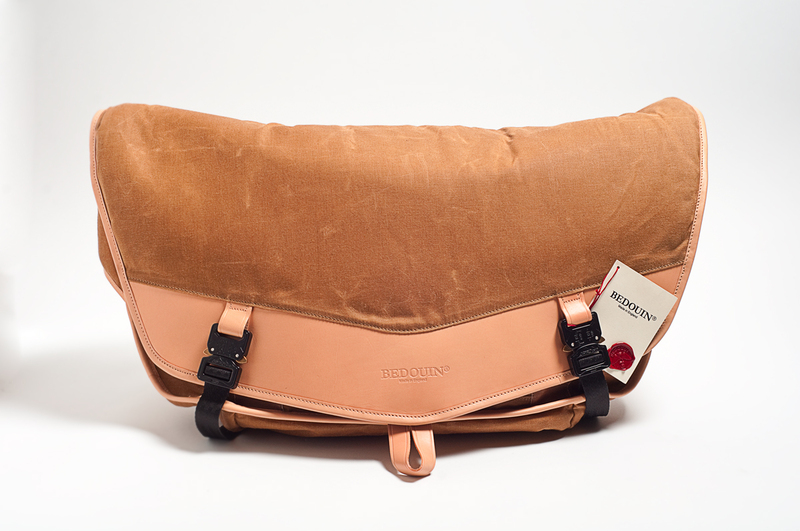 Bedouin make well designed high quality bags that can snap any man back in to a state of sartorial alertness. Every aspect of their leather creations is thought through in extreme detail. 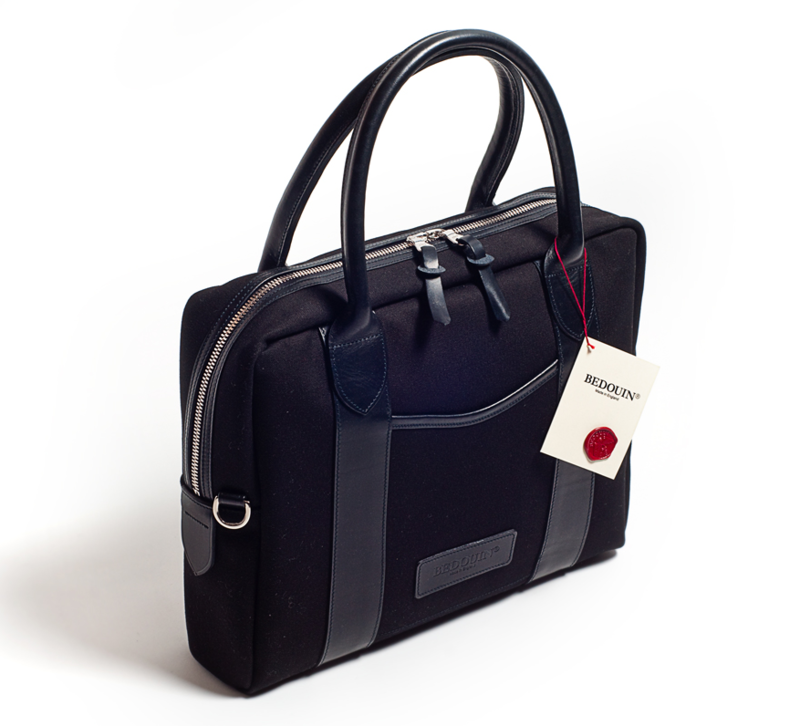 The bags are hand made in England, using a level of craftsmanship and attention to detail that English luggage makers are known and admired for. The bags are inspired by traditional craft, geometric art, the macabre and surrealism and are designed for comfort and durability. 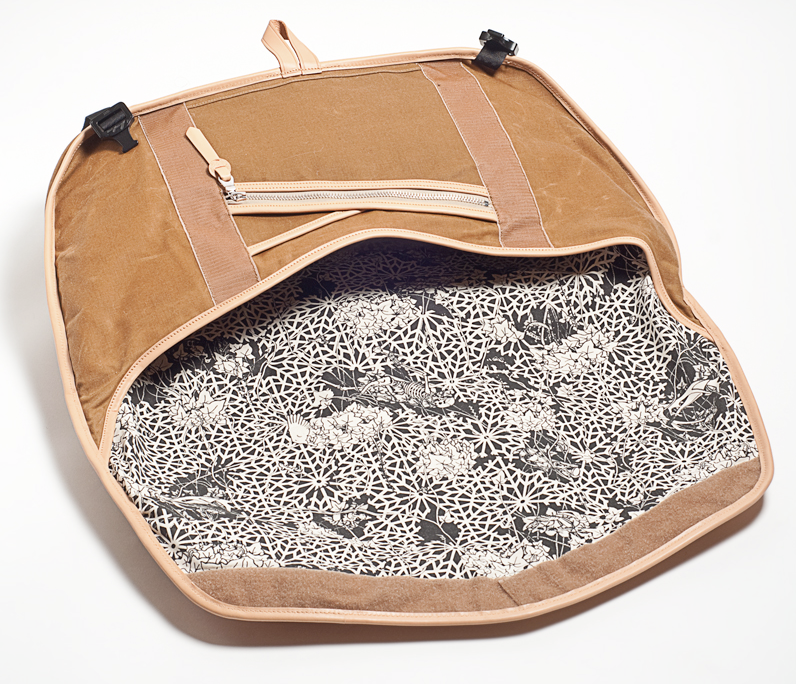 An everyday bag, ideal for the daily commute and will fit all your daily essentials comfortably. In addition to being hand crafted in England, the very best of materials are sourced from across Europe. Fabrics are sourced from the best British suppliers for their quality, durability and feel. The leathers are European or British and are naturally tanned using vegetable tanning agents. Stitching is of the highest quality and weight. 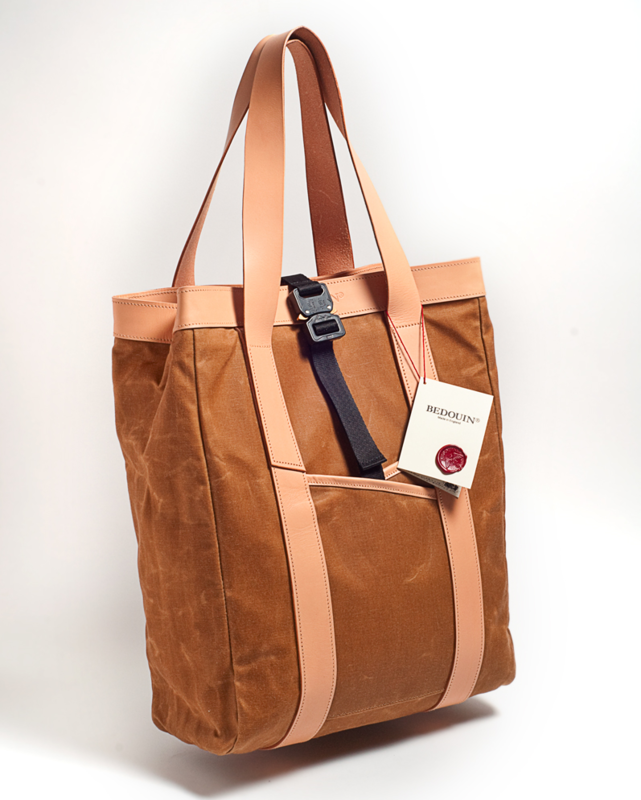 Each is made with waterproof waxed cotton or canvas (120z Rhinowax is used for the tote and messenger) and designed with the specific function fully in mind. The hardware on the bags is sourced from the best engineering companies, zippers are from Switzerland and the Cobra buckles are forged in Austria and are noted for being the worlds strongest buckle. The Mamluke - a great weekend away bag or a larger daily bag. What sets these bags apart is that they are beautifully made and perfectly proportioned for each use. The Mamluke overnight bag, the Barbary messenger bag, the Janissary laptop bag and the Medina tote are all fit for purpose, like any good piece of design. These bags will certainly protect your belongings. 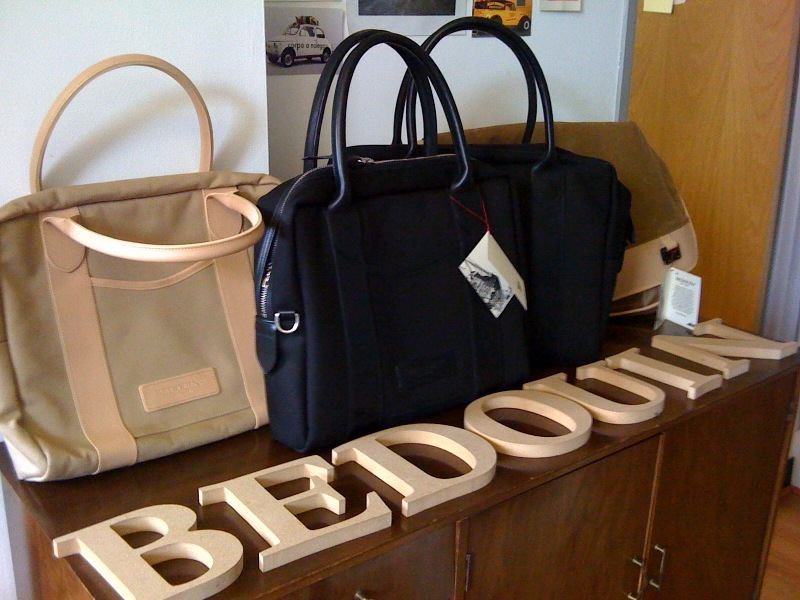 At Bedouin they believe in quality and each purchase should last a lifetime. They do not believe in disposable fashion and an endless replacement cycle; buy quality and buy it once. They are extremely confident of the quality and workmanship of their bags, which is why they offer a lifetime guarantee on materials and workmanship from normal wear and tear. Everything is cut by hand and then stitched on a couple of heavyweight machines, there are no shortcuts taken in the creation of these bags. The new look Medina tote bag particularly caught my eye. You might have seen a well written piece in the new and improved fashion section of the Times this morning (available to view online here). In the well written piece that saw the stylist examine the handbag fixation he was forced to declare that "this (Bedouin) newly launched hand made in England brand has done for me what the Alexa and Hillier are doing for my lady friends." To put it simply he had found a collection of bags that he would happily parade around town regardless of whether they were empty or not and confessed that he now needs one in every colour. After seeing the bags up close I can certainly see where he was coming from. Update: I have just seen another great piece on Bedouin over on Gentleman's Corner. Via this piece I learnt that the brand is headed up by Silas Grant, a CSM graduate and ex senior design specialist at Nokia. Grant says, “In my opinion, selling a bad product on the prestige of your brand is a short term strategy, and not sustainable for the long term. Classic quality never goes out of fashion. I keep the prices really tight at Bedouin, but quality does cost more. Buy quality and buy it once”. The Barbary - a large capacity professional Courier Bag designed to fit the body, contract and expand depending on the load being carried. Bedouin base the design of each bag on the metaphor of the Bedouin tent. A nomadic shelter, rugged and weatherproof on the outside, whereas inside they offer luxury, shelter and comfort. Their bags follow the same metaphor, rugged and durable on the outside, dust proof and water resistant. 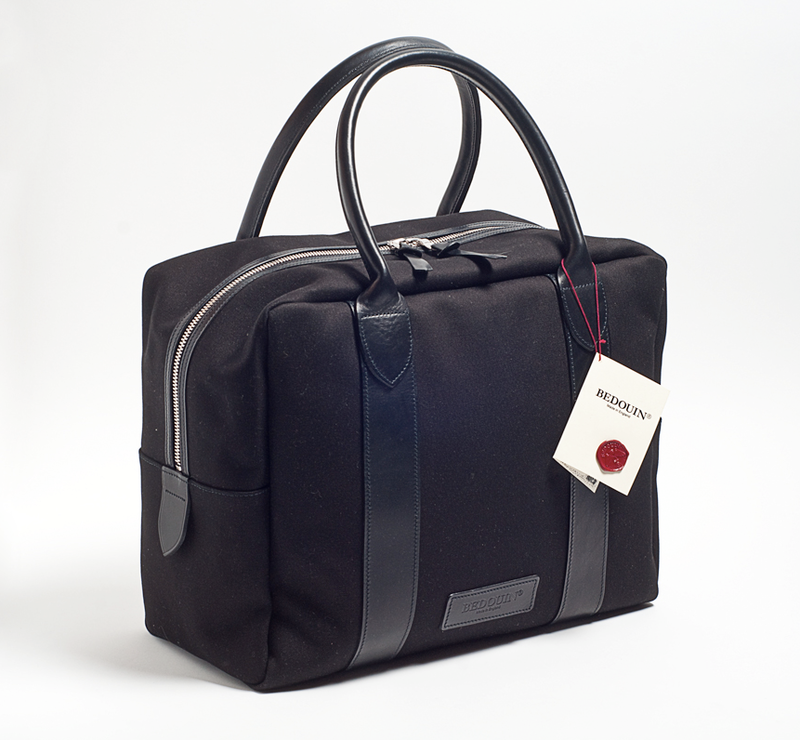 Inside, printed linings and padded compartments provide secure storage for any personal possessions. I personally love the addition of the distinctive and macabre illustrations that decorate each of the bags interior cotton linings. These are far from your typical 'manbags' and I'm pleased that I swapped my bed for Bedouin. A look inside the Barbary. Any idea where they can be got online? Their website is terrible. Anonymous: Oh no...I quite like their website. I don't think you can buy any of them online yet but they have a number of stockists in the UK and Asia. Where are you based? i love your blog. following ! IVY: Thanks! We hope you continue to enjoy reading out posts.